Premium hardwood flooring is prized for its’ unique colors and stunning grain design. The material is meant to last a long time with prices that any average homeowner can get behind. 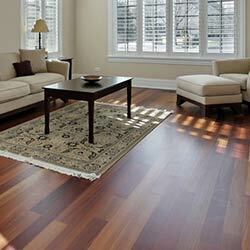 Most flooring hardwoods are very dense but are easy to maintain. They come in a variety of colors, grain patterns and styles. However, homeowners will need to refinish the floors annually to keep them looking vibrant. Hardwood flooring lends an elegant and sophisticated look to your home. They are durable and very hard to dent or scratch. If there is a scratch or blemish, however, it is easy to repair the wood by sanding and refinishing it. Because of this durability, hardwood floors are perfect for areas that experience high traffic, like foyers. Many exotic woods are water and insect resistant which make them perfect for kitchens and bathrooms. They are also resistant to decay and fungi as well as mold. Houses with wood floors are more valuable than those that have carpet. When premium woods are used for flooring you will get vibrant and unique colors that are not seen everywhere else. There is also more variety when choosing an exotic hardwood rather than a domestic one. Grain size, grade and color are some of the options you can choose from when trying to pick the type of flooring to use. These types of flooring requires little to no maintenance and is also a higher quality material. The price for exotic hardwood flooring is comparable to other hardwoods but the value is much higher in terms of how long it will last. Some species of lumber will cost more but it will not last as long. With exotic hardwood floors, you can customize the look and feel of your home while building your floors to last. Visit the products page for more information on premium hardwoods. For more information on exotic hardwood decking products or to order, call Us at 1-888-973-0073 or use the contact form on our contact us page.